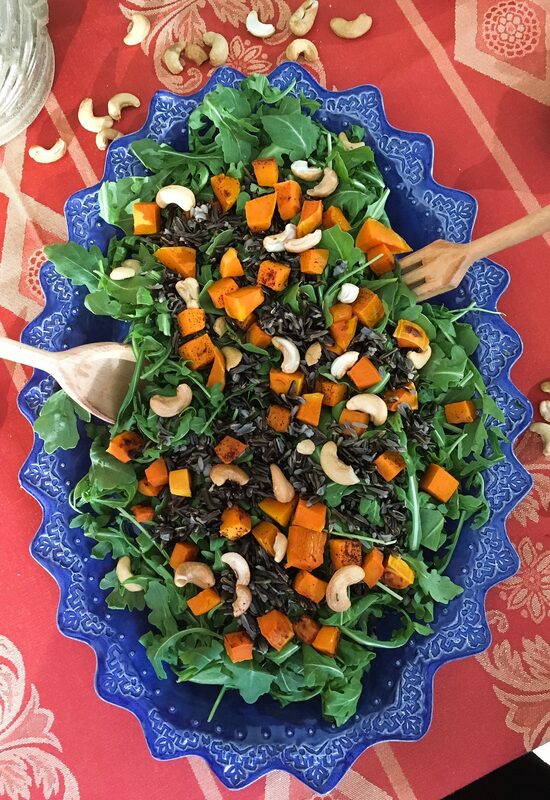 If you follow me on Instagram, you’ve seen me post about this Butternut Squash Arugula Salad many times before, simply because I eat it ALL the time- it is my favorite fall salad! Arugula is my lettuce of choice because it adds such a unique peppery flavor, as opposed to just a watery “crunch” from other varieties. The squash provides a touch of sweetness, the rice adds a perfect chewiness, the cashews offer a nutty crunch, and the tart lemon dressing is the perfect flavor to bring it all together. 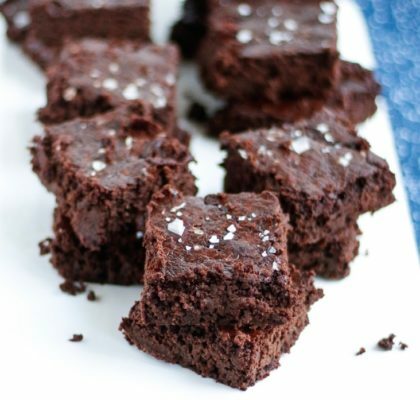 This time of year, I really try to to keep my meals throughout the week nutrient dense, since I know I will be indulging throughout the many holiday parties of the season. When we devour a lot of sugar and processed carbs and fat, our body is stripped of nutrients, at the same time it’s working overtime to clear those substances from our systems. 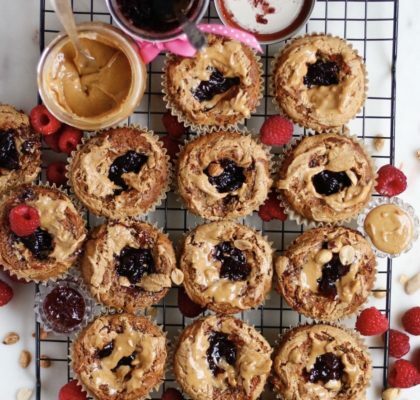 So, if we’re going to consume some not-so-good-for-us foods, it’s the least we can do to to flood our body with as many vitamins and minerals afterwards. 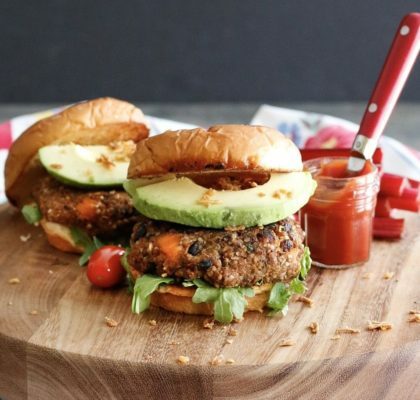 Keep reading to learn the health benefits of this arugula salad. As I mentioned above, arugula provides a ton of flavor, for very minimal calories. Two cups is only 10 calories, making this a great “volume” food, meaning you can eat a lot of it to fill you up, without consuming a lot of energy. For this reason, this lettuce scores in the top 20 foods on its ANDI score (Aggregate Nutrient Density Index). The ANDI score measures vitamin, mineral, and phytonutrient content in relation to caloric content. 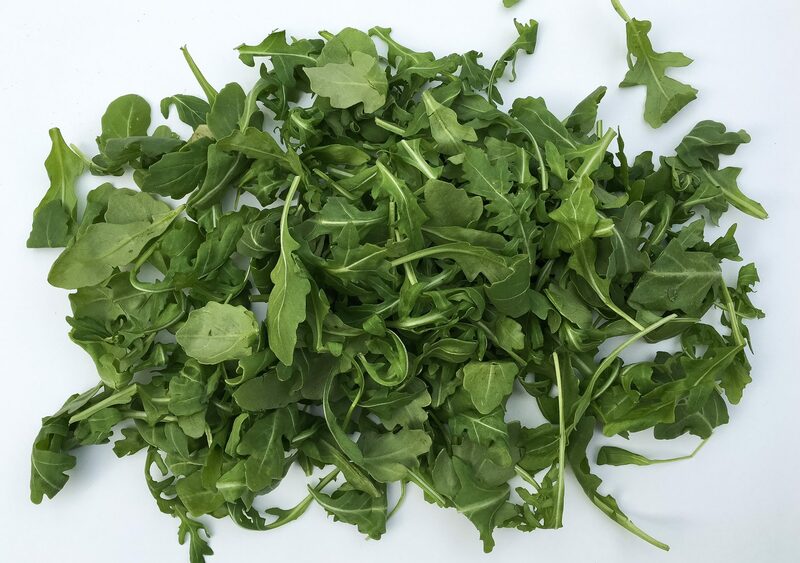 Arugula also contains very high nitrate levels, which have been shown to lower blood pressure, reduce the amount of oxygen needed during exercise, and enhance athletic performance (which is why many pre-workout supplements contain nitrate). Black rice is not common in our culture, despite being used in ancient Chinese culture for it’s powerful healing properties. It was known as “forbidden rice” since it was hoarded to only to be consumed by royalty. 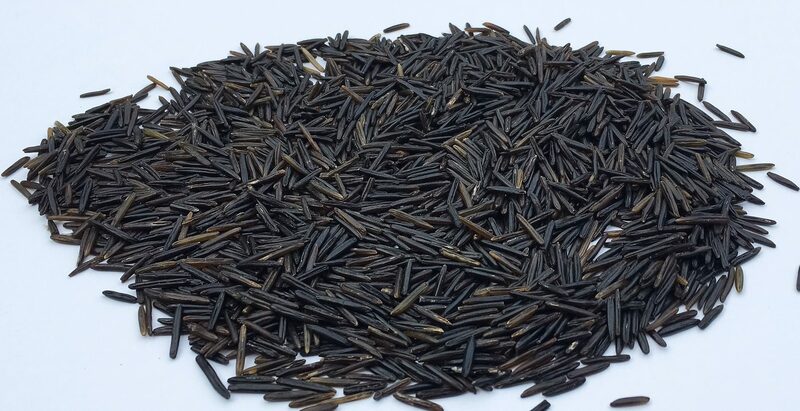 Black rice has been shown to contain equal amounts of antioxidants as blueberries- quite impressive since blueberries are often touted as the highest antioxidant containing fruit or vegetable. Antioxidants help protect the body from free radicals, warding off disease and premature aging. Additionally, this unique grain also helps to reduce inflammation in the body. Cashews are a good source of magnesium, which plays an important role in hundreds of reactions within the body, including the metabolism of food and synthesis of proteins. Magnesium also aids digestion, calms anxiety, relieves muscle aches, helps improve sleep, and regulates levels of other electrolytes in the body such as potassium and sodium. 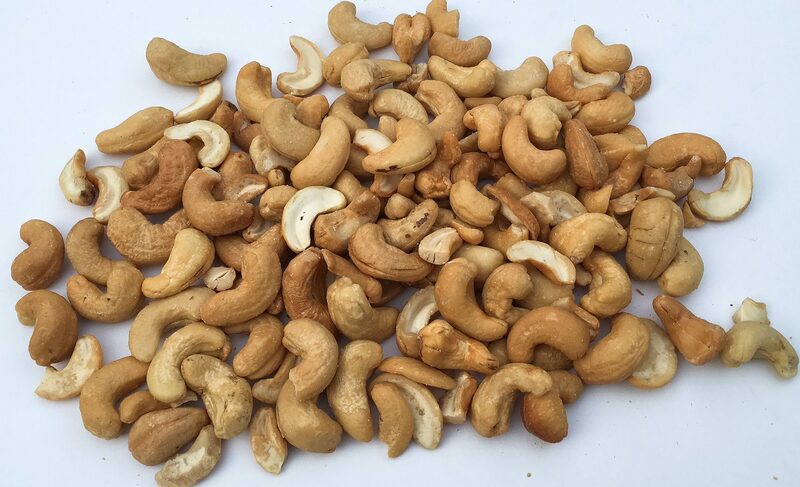 Cashews also contain vitamins E, K, B6, along with other minerals like copper, phosphorus, zinc, iron, and selenium. Finally, did you know that 2 handfuls of cashews provide the same therapeutic effect as a dose of Prozac? Only further proving the point that #FoodIsMedicine! 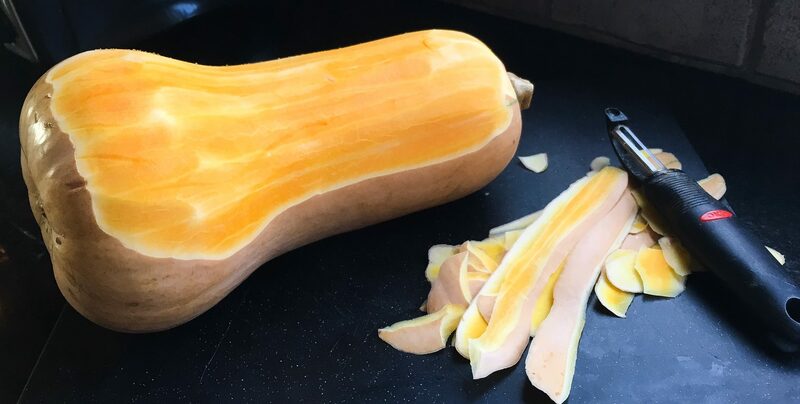 My favorite part about butternut squash is that it is also a “volume” food- when it’s roasted, it tastes just like sweet potato, yet has half the amount of carbs per serving, with 1 cup only containing 53 calories! Also in that one cup serving, you’re provided over 400% of your Vitamin A, half of your daily Vitamin C needs, and more potassium than a banana. 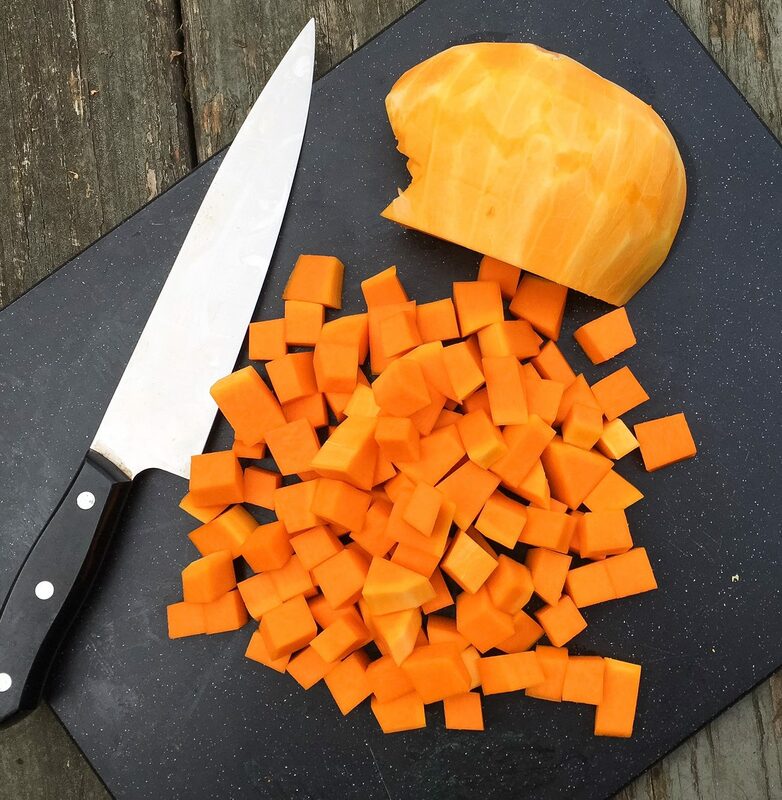 This vegetable is perhaps my favorite part about winter, as I incorporate butternut squash in my diet every week when it’s in season. I realize it can be a bit intimidating to know how to prepare, so below I’ve broken it down step-by-step. 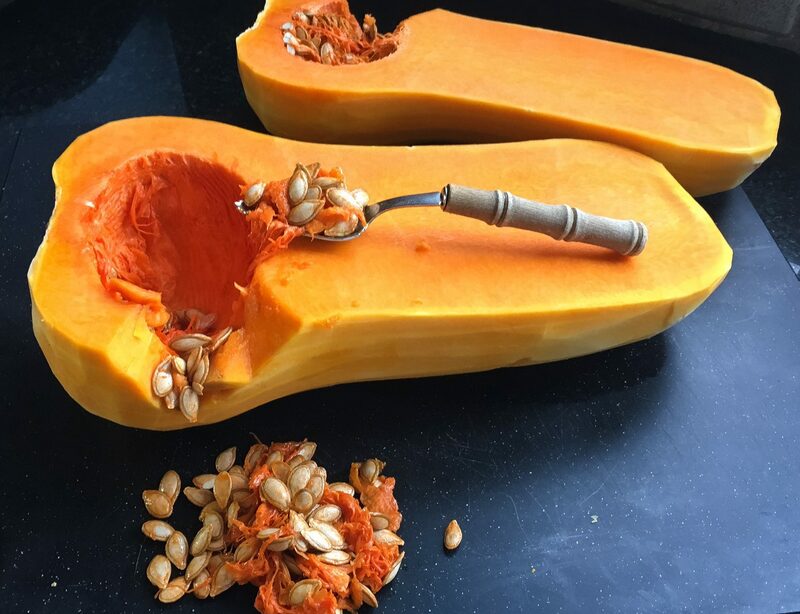 Step Two: Slice the squash in half and scoop out the seeds and pulp- I like to use a grapefruit spoon to do this. 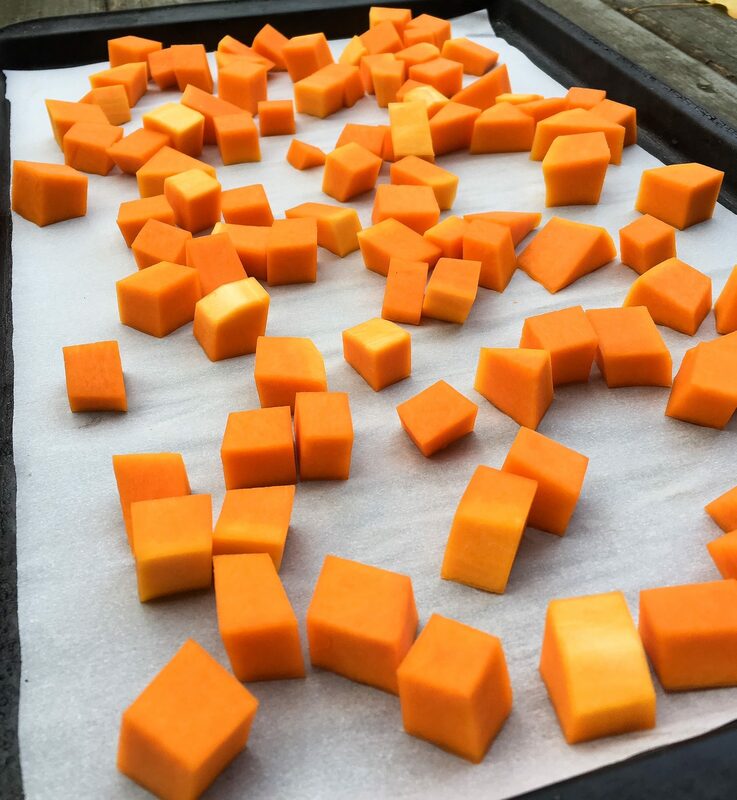 Step Three: Dice the squash into approximately 1/2 inch cubes- I prefer a smaller dice so its easy to eat in small bites for a salad. Step Four: Spread squash out on a baking sheet in one layer, with plenty of space between pieces so the squash will roast crispy instead of steam. Toss with spices, and a splash of olive oil, if using. 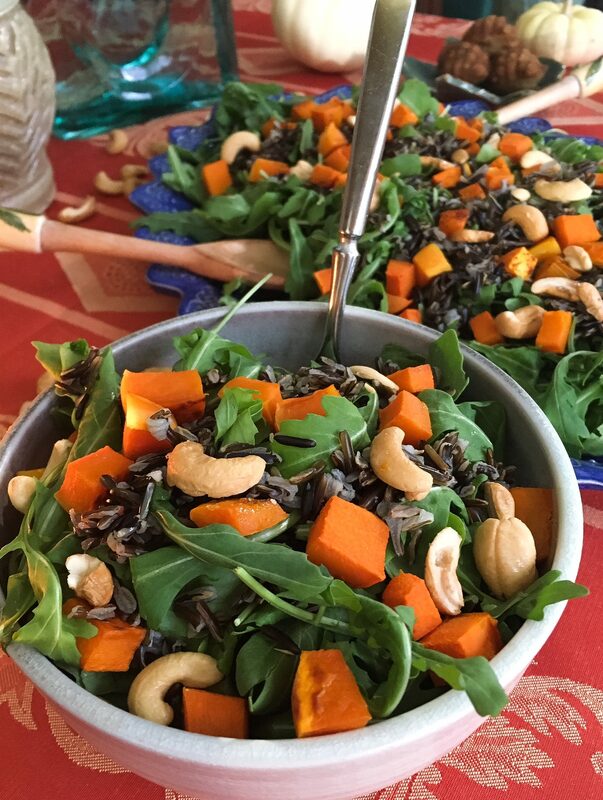 Butternut Squash Arugula Salad is naturally gluten-free, dairy-free and vegan, and is hearty enough to be served as a main course. However, for the carnivores at your table, top this salad with a few slices of grilled chicken, also seasoned with chili powder, or serve on the side. Prepare black rice according to package instructions. Typically it is as follows: Bring 2 1/2 cups of water to a boil. Add the rice, cover, and reduce heat to low. Allow the rice to cook for 45-60 minutes, until tender. When finished, drain remaining rice from the pan, and fluff rice with a fork. While the rice is cooking, preheat oven to 425F. 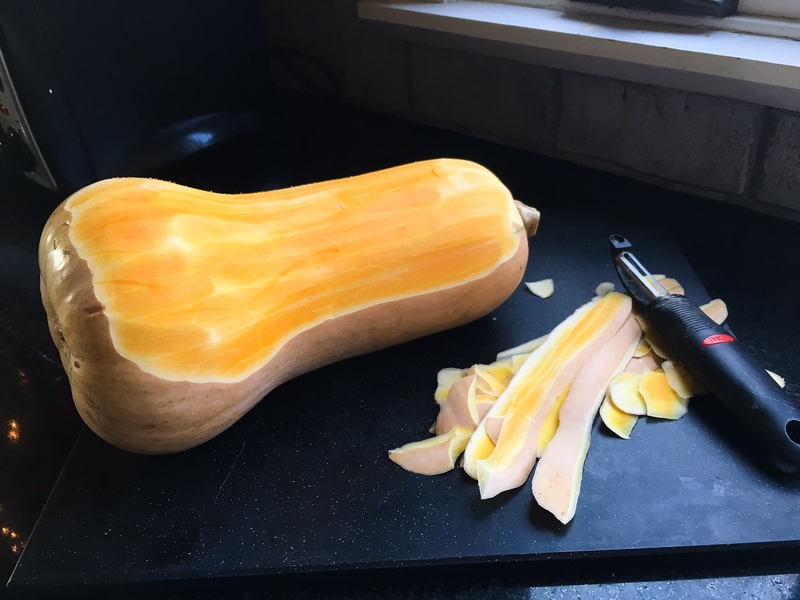 Peel, de-seed, dice and season squash (following the method above) and bake 20-25 minutes until a fork easily pierces. Note: You can add the olive oil to the squash before baking, but I’ve found it bakes just fine without the oil, thus reducing the fat content. When squash comes out of the oven, pop cashews in on another baking sheet and allow to toast 3-5 minutes. Meanwhile, stir together the ingredients for the dressing, adding sweetner and sea salt to taste. 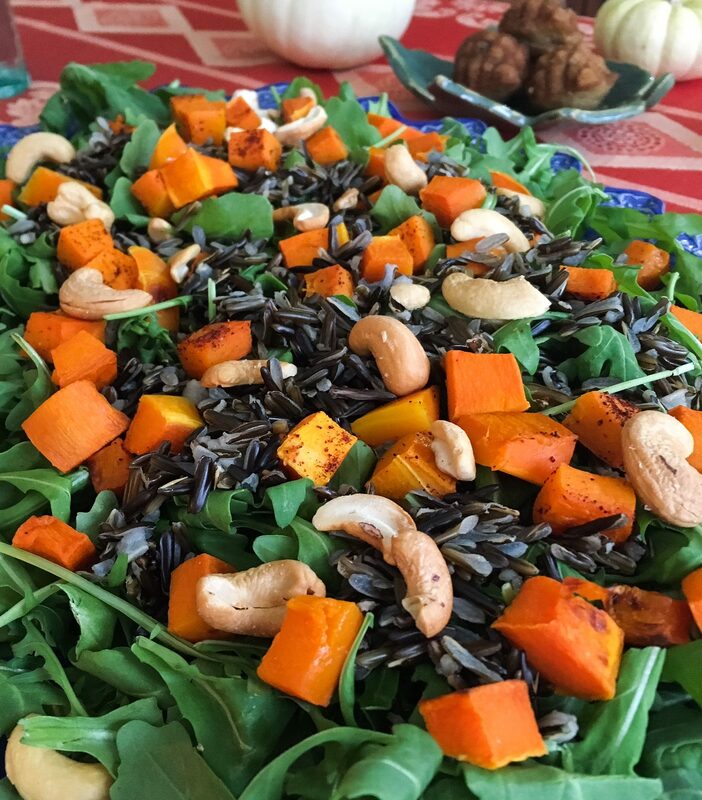 To assemble, place arugula in dish, top with black rice, squash, toasted cashews, and finally toss with dressing, to taste- I often don’t use the entire batch. This salad can be served warm or room temperature, and I even think it tastes great after being refrigerated!